Nobody has a more comprehensive library of catalogs than World American! To download the catalog of your choice, simply right click on the link “Download PDF” or on the image and select “save as” to start the download or left click to open in your browser. Each of our catalogs listed below is in .PDF format and will require a .PDF viewer such as Adobe Reader. Click here to get Adobe Reader. If you don’t see what you’re looking for or you would like a hard copy version, please contact our expert staff toll-free at 1-800-934-2727. 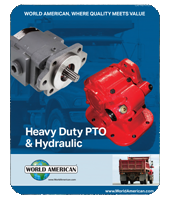 World American is pleased to announce the release of the NEW larger format Wheel Stud catalog! The new catalog gathers all of World American's wheel studs into one easy-to-use 11x17" catalog.